I downloaded the latest release of Eclipse (Mars) and changed the required Java version to 1.6 in eclipse.ini file as my project uses Java 1.6. JRE version less than 1.7 is not supported. Is there any workaround to use Java 1.6 in Mars version as I'm unable to upgrade to Java 1.7 at the moment? I faced the same problem after upgrading to Eclipse Mars. I solved this by changing the runtime environment of the external tool configuration of the project to JDK7. But this will create another problem, the compiled jar will be in JDK 7 and this will not work on production servers with JDK6. As per suggested from @dag and @Chris, Here is updated ant javac task. We fixed the problem for us using a patched Ant plugin. For Eclipse Neon, also see this link as is noted in the comments on the first page. please take a look at the <javac>reference https://ant.apache.org/manual/Tasks/javac.html#compilervalues and add the following attributes to your <javac>-Task: compiler="javac1.6" source="1.6" target="1.6" executable="[path-to-jdk-1.6/bin/javac]" fork="true" taskname="javac1.6". No you cannot go for JDK1.6 or less because Eclipse Mars only runs with Java >=1.7. Refer this link. 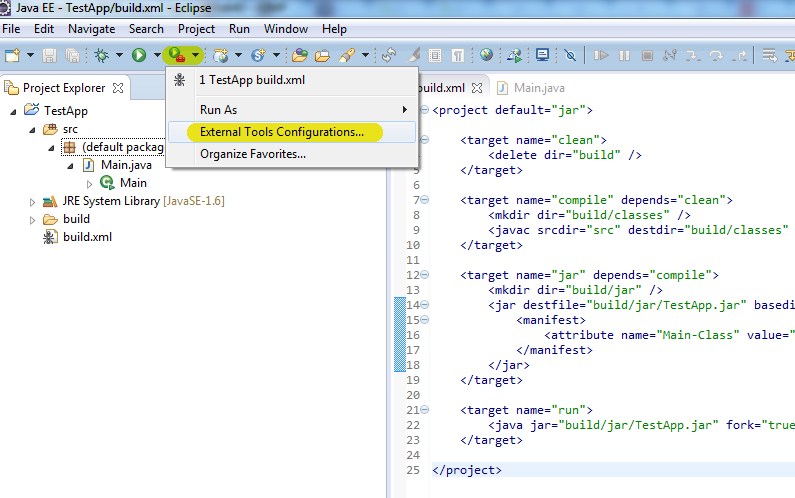 The Java you use to run Eclipse does not have to be the same as the one you use for your projects. 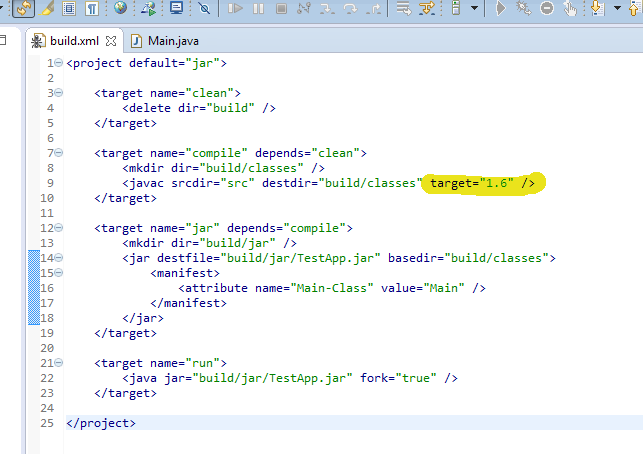 You must run Eclipse Mars using Java 7 (or 8) but you can use Java 6 for your projects. 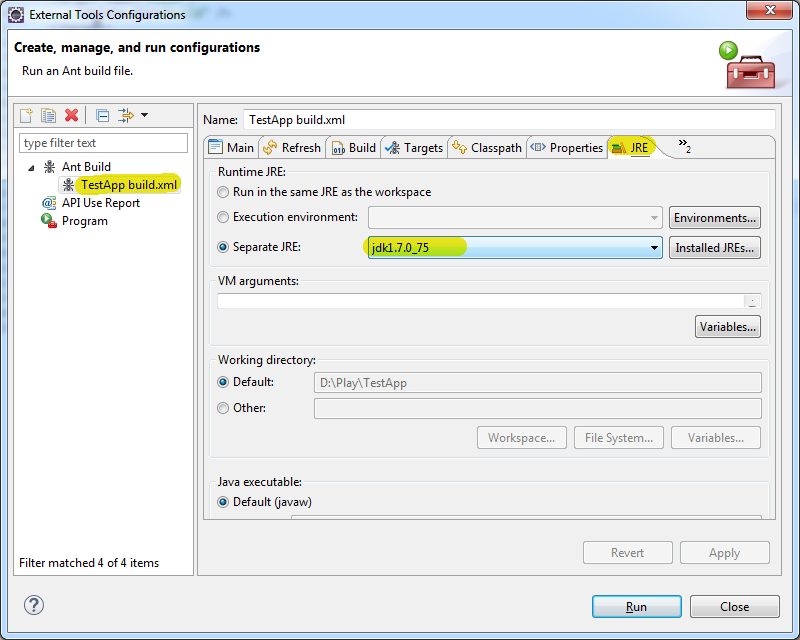 Tell Eclipse about Java 6 in the Preferences in 'Java > Installed JREs' and set that as the default (or select it in individual projects). I have Eclipse Oxygen running on JRE 1.8 but building some old 1.7 projects, and have jdk1.7.0_40 installed as a separate JRE and set up in the tools external config, but still got the "jre less than 1.8 not supported" error. What fixed it for me was just updating the build xml configuration directly, especially if you have another project which does work that you can copy from. And restarted Eclipse to pick it up. No idea if this is moving forward or backwards in terms of Eclipse support, but it fixed my problem. 1) Java home ended up staying pointed to Java 8. 2) Set in the Ant script the values suggested by @Chris. 4) Project settings build path and compiler levels were all set to 6. 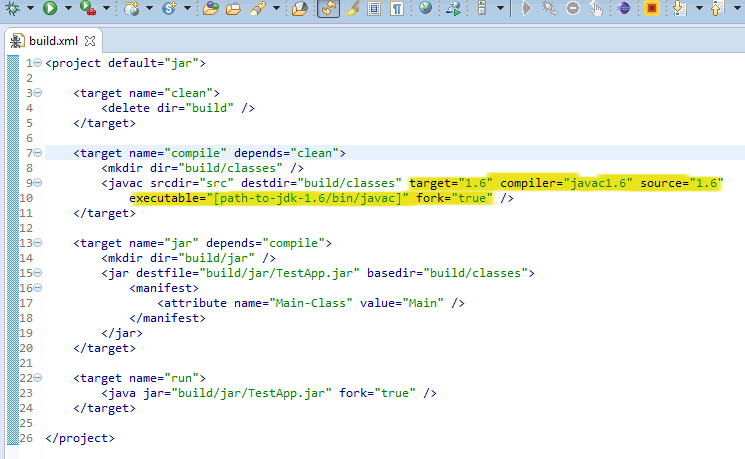 This produces a build at the Java 6 level that worked for me. Not the answer you're looking for? Browse other questions tagged java eclipse ant eclipse-mars or ask your own question.